Discussion in 'General' started by Anashel, Jan 21, 2017. I am excited to announce the release of NITE Team 4 Alpha 0.2 planned for Friday, January 27th! It's the first iteration of the Stinger OS. Alpha 0.2 will ship with a small recon mission and four attack tools. It will also support six workspaces for multitasking, multiple terminals per workspace and four visual skins. In preparation for Alpha 0.2, we worked on our mission briefing structure. Similar to TBW, NT4 will use NPC audio and video to provide mission intel. It will not, however, use the Archive (Example: archive.blackwatchmen.com) as part of its mechanics. All intel files will be accessible from within the Stinger OS. One type of format we wish to use is the 'recon graph'. We thought using real intelligence software to produce our documents would be more immersive and also more productive. So we decided to choose Maltego to create all our Recon Graphs for NT4. As an added level of immersion, it's going to be possible to download the actual Maltego file from all mission briefings. Although this is NOT required to solve your assignments, we may hide secret missions in some of the briefing documents. But it doesn't stop there. We have built an NT4 Seed server for Maltego CE that will install a set of NITE Team 4 entities and transforms. Transform requests will let you query existing NT4 and TBW online databases to gather live intelligence on various entities in your investigation graph. Since Stinger OS and Maltego transforms will share the same NT4 database, you will be able to complete part of the recon in the game or in Maltego. Maltego CE is a free investigation tool available on Mac, PC, and Linux. You can download it here. You will need the latest version of JAVA. Jason, gentianbrija2010, Crazypedia and 9 others like this. To use those files, you need of course Maltego CE installed (Go to the link Anashel provided, create an account and download the client). First, you want to import NT4 entities. To do this, go on the weird round menu icon and go to "Import entities" as seen here : http://i.imgur.com/d9P6ZpN.png, and select "NT4-Entities.mtz" from the zip. 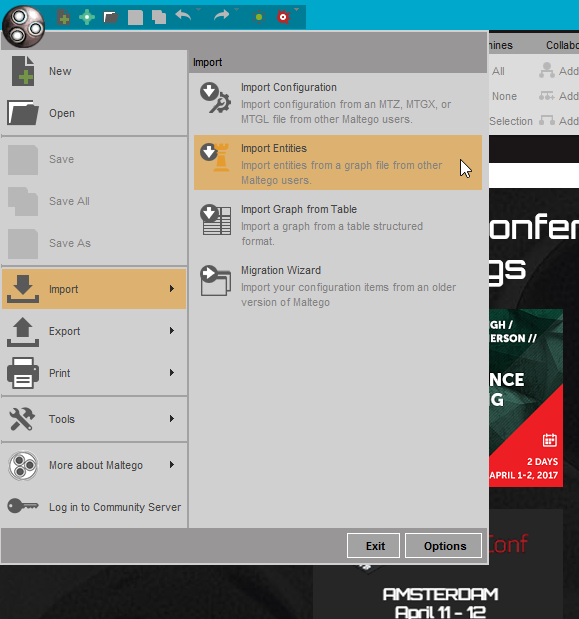 Tick the 2 boxes to import Entities and Icons, and validate on the next screen. Once that done, you now need to open the graph. Click again the menu, and select "Open". Find the "Rhopagroup.mtgl" from the zip and it should open the graph. PS : I know the whole explanation was not your question, but I figured if other people wanted a quick howto to try the software, why not =D. Crazypedia, DeiDhena, Jarobi and 1 other person like this. Fantastic tool, it's been a lot of fun learning to use it! Hey gentianbrija2010 you need to be installing Maltego CE not Maltego Classic. No free keys for expensive software! gentianbrija2010 and Balamung like this. Oh Cordially thanks to you for your guidance, for your assistance. I have installed the MaltegoCE in the computer, and, I have imported all Entities. i think the devs are still working on that? Hi Brother. AirCrack in NT4 cans finds passwords wifis points. ? yes, run airodump, then handshake with each downloaded MAC address, you can just type half of handshake and hit tab twice too get the data points, match the data points with the observed times your target was near the wifis and access your backdoor by clicking on that point. then you can run a password attack with the data you collect from the phone. @themadhuman thank you. brother. can you make an video. because. in NT4 the modules, are not unlocked. This looks and works a lot like Analyst Notebook, one of the tools I use at work. This looks like a neat little investigation tool. Can this be used in current Black Watchmen missions? Can I use it for Season 2, and to what degree? So I was looking into Maltego because new levels of immersion are always fun. So besides the map that we got from the zip files, are there more? Or are we supposed to be making them ourselves? I just saw in the first post about downloading Maltegos from the mission briefiings. Unless that is still in the works? Imake my own as from what I've heard, the missions at release will be pretty intense and indepth and with my own chrt set up, I can add nptes and the like.